Pundits may disagree on the extent and scope of climate change, but the global climate is changing. See Joint science academies’ statement: Global response to climate change, available at http://www.nationalacademies.org/onpi/06072005.pdf. Impacts will include sea level rise and more impactful but less frequent storm events, among other things. Adaptive planning today, will determine how resilient future communities will be to these impacts--particularly for costal communities like Hawaii. moderate to severe drought, water scarcity and food insecurity." Climate change adaptation planning is a crucial policy component for addressing climate change that is frequently overlooked by public and private decision-makers. For even if the US were to switch to "using sources that emit no particulates, like nuclear and natural gas, [this] will not make a major difference in averting near-term changes in the climate caused by carbon dioxide. [And,] . . . widespread use of renewables such as wind and solar won't help much, either." See Rober Bryce, Five Truths About Climate Change, Wall St. J., Oct. 6, 2011, available at http://online.wsj.com/article/SB10001424052970203388804576612620828387968.html. 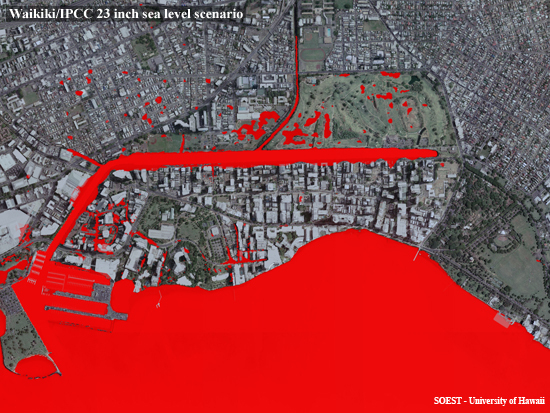 Figure shows Waikiki/IPCC 23 inch sea level scenario.